I was involved in it (Sea King) right from the start. 2 or 3 different alliterations I was party to. We developed the new composite rotor blades, both for the tail rotor and for the main rotor for the Sea King, I was involved with that. I was involved with the Commando version, where we got rid of the folding undercarriage and the sponsons and had a fixed undercarriage and it was basically a flying truck to carry 30 troops. Got involved with the airborne early warning as a direct result of the Falklands crisis because, when they had the Falklands crisis, one of the reasons we lost a couple of our ships, or some of our ships, was that they didn’t know that the Argentinians were coming with their Exocet missiles, which they would have done if they still had the Gannett, as they were airborne early warning aircraft. 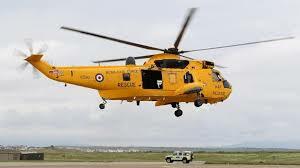 They didn’t have an airborne early warning aircraft so we very quickly developed an airborne early warning Sea King. Looked a bit of a ‘lash-up’ with a great big radar fixed out the side of it but I got involved with all that. Very much got involved with Egypt. The VIP Sea King which President Sadat was going to use for the re-opening of the Suez Canal and got very involved with that and spent very happy weeks in Egypt with the Egyptian Air Force, getting all sorted for it. Went over there about four times as we made the Commando variant. We also made them airborne early warning – no – an electronic counter-measures aircraft, as well. It’s a good rugged aircraft, as I said. For a start, you walk-up some steps to get into it. You don’t have to clamber through the window or, hop through the top. You actually walk-up to it, you walk-in it and then you sit down. It exudes this sense of ruggedness and confidence. You can sit in it, getting on for gale force wind, over the sea 40 foot from tremendous waves and you are steady as a rock and you have every faith in your vehicle.